FIRST in FLIGHT brands North Carolina’s place in history. “Success four flights.” The telegraph from the Wright brothers to their father, Milton Wright, was the official announcement that heavier than air, controlled, manned, powered flight had been achieved. December 17, 1903. And as planned, the Wrights returned home to Dayton, OH, by Christmas. The Wrights first arrived on the Outer Banks in 1900. Orville Wright last visited the Outer Banks in 1945. But December 17, 1903, is the date most recognized in American and aviation history. And the photograph of the First Flight taken by John Daniels, a member of the Kill Devil Hills Life Saving Station, is perhaps the most famous/recognized photographs in the world. The world celebrated the First Flight Centennial in 2003. Without question it was “The Event of the Century”. In 2011 the world celebrated another centennial, Soaring 100, the 1911 World Record Glider Flight of Orville Wright that introduced Modern Soaring. The legacy of the Wright Brothers extends beyond meticulous detail, calculations, and a desire to fly. Their work and success embodies hard work and perserverence. The First Flight Foundation joins with aviation partners to tell the complete Wright story and, specifically, the North Carolina Wright story. 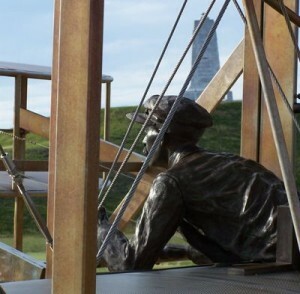 Shop our online store for Wright Brothers National Memorial “Soaring 100” merchandise. Making an online gift today is the simplest and most direct way to support the First Flight Foundation.